"Why didn't somebody warn me about this." I received my starter kit and since I work full time ... I managed to get 15 out of 25 made and was ready to send my &quottest" run in to you. Before I did, I took them to the office to show. I decided to put them on a table with a sign stocking stuffers. Within 30 minutes 5 sold that was yesterday. Today I sold 3 more and received an order for eleven more needed before the 24th and yet 3 more ladies telling me that they want 2 each. I have a friend that is taking them to the beauty shop friday to sell for me. I wasn't expecting this somebody should have warned me how fast these crosses sell. I should have ordered the starter kit two months ago." "I was able to provide my family with a great Christmas!" I got started making the Disciple's Cross necklaces during the Christmas holidays just hoping to make a little extra money. The first couple of necklaces I made really were not all that good so I simply gave them to a few co-workers. And before I knew it I had people coming to me from all directions wanting buy one of my crosses. They were an easy sell at $5.00 each. I sold dozens of them, and needless to say I was able to provide my family with a great Christmas! If you're looking for Business Opportunity that is going to make you a millionaire then perhaps this program is not for you. But if you're willing to put the forth the effort into something a little more realistic that does turn a profit, then give this program a try. This opportunity is REAL and best of all... it works." "They were an instant hit with the kids." My niece introduced the Disciples's Cross to me. She started making them when her husband was very sick with cancer. He wasn't sleeping at all, so she would stay up all night making crosses. Brady was a true warrior for God. He made a tremendous impact on so many people, especially youth. I took a group of youth from First Baptist Church in Haleyville to visit Brady one week-end. Jennifer had some necklaces made, they were a instant hit with the kids. The youth in Haleyville relate the Disciples' Cross to the tremendous faith in God that Brady had. 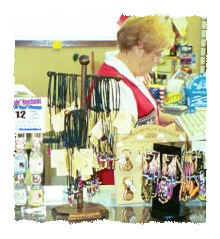 I enjoy making the necklaces and passing them on to so many people." "John has been a pleasure to work with." I have carried the Disciple's Cross in my store for over two years. It sells through very quickly and I have yet to have one returned. John has been a pleasure to work with and I heartily recommend carrying his merchandise to any retailer."